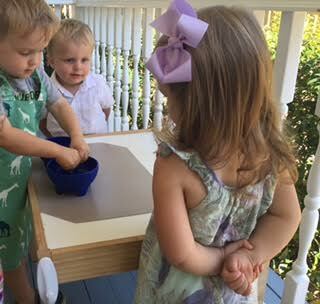 Practical life is the heart of any Montessori Toddler Classroom and plays a major role in the development of children for years to come. Practical life offers several major benefits to the child: the acquisition of a practical skill, the development of focused attention, and preparation for writing and reading. Over the course of the two-year cycle in the toddler classroom, your child will have the opportunity to develop his/her skills in increasingly complex fine motor activities, care of self activities, care of the environment activities, and water activities. As a part of the care of self curriculum, your child will be learning to dress him/herself, hang his/her own coat up on a hook, as well as use velcro, buttons, zippers, and snaps. Threading beads and lacing work offers preparation for more complex dressing skills they will work on in the primary classroom (such as lacing and tying shoes). The care of the environment and fine motor skills curriculum is vast. Your children will have the opportunity to learn opening and closing various containers, spooning items from one bowl to another, dry pouring, pouring of water, transferring items by hand and with tongs, dusting, hammering, carrying a chair, folding a variety of cloths with a variety of folds, washing cloths by hand, washing dishes by hand, washing a table, sweeping, using a dust pan & brush, mopping, setting a table, and many more! It is important to note that these are the opportunities every child will have in the toddler classroom, but every child will not master every skill. Because the children have the freedom to develop themselves, there will be a great variety of skill acquisition. However, there are only good choices of activity in the classroom, so you need not fear that your child will spend hours idle. All work is important work, and we get to see how each child uniquely unfolds! According to the material originally designed by Dr. Montessori, the child will first develop focus in the practical life areas. Toddlers, as well as 3 and 4 year olds, naturally gravitate to these areas. 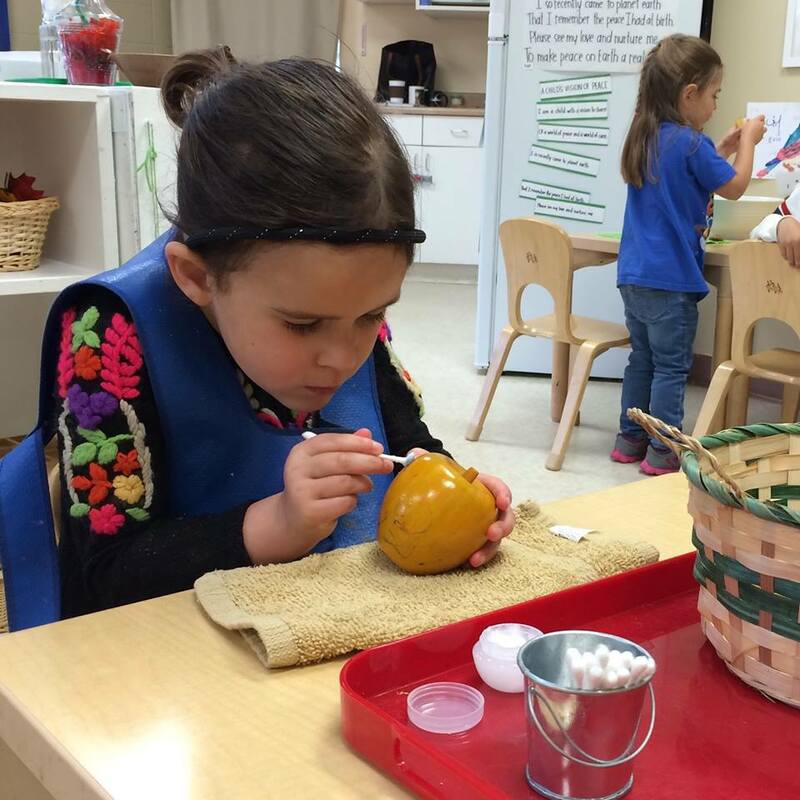 Dr. Montessori noted this and developed the curriculum so that the activities start simple and slowly increase in difficulty, with specific areas of focus. The child will learn to concentrate well by spending much time in practical life. 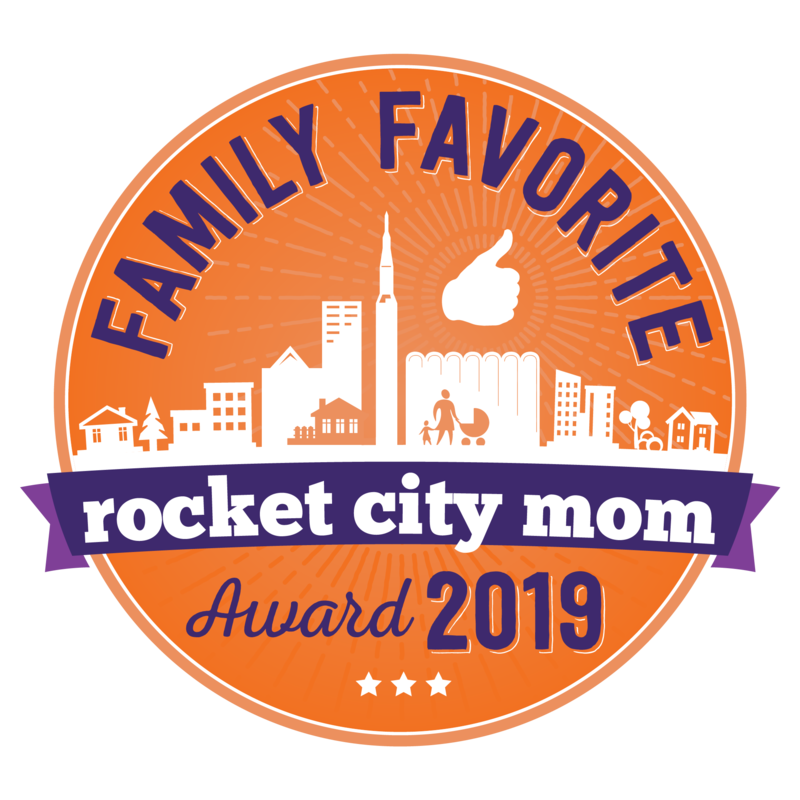 With this foundation in toddlerhood and up to around 4 (or sometimes 5), he or she will be ready to spend focused time in other ares of the classroom, becoming much more competent in these more abstract areas when they are developmentally ready for them. What is Practical Life and why is my child spooning, pouring and washing windows at school? With so many new children and families entering Primary II this year, Monica and I realized that it would be beneficial for us to address the incredibly important area of the classroom known as Practical Life. Perhaps your child has come home and told you she did pouring work, polishing work or even arranged flowers. Maybe you have watched uneasily during drop-off as a child carried a tray full of glass objects and just were not sure what the point of all this was. It is in the Practical Life area where children learn the foundation for all other areas of the classroom, what you may have heard us refer to as O-C-C-I, which stands for order, concentration, coordination and independence. While the activities may appear simple, they are highly purposeful, and can be quite complicated with many steps. It is in Practical Life children learn the basics of self-care, care of the environment, and activities that encompass everyday living, or “domestic curriculum.” These activities are meant to fill in the gaps of a child’s life because it is here she will learn to dress well, speak well, and become capable of taking care of her own hygiene. Children begin to understand the importance of manners, what we call in a Montessori environment, “grace and courtesy”. These skills when developed repetitively over time lead children to a greater sense of independence and accountability for their actions. In Practical Life as in all areas of a Montessori classroom, it is critical that the environment is beautifully prepared, because when we use objects that are real and beautiful, and come from nature, items like glass and wood, and we provide work that imitates adult activities but are child-sized, children find tremendous value in their work. They are called to the materials, and they become tuned in to the process of actually doing, and making mistakes along the way, as opposed to focusing on the final result. 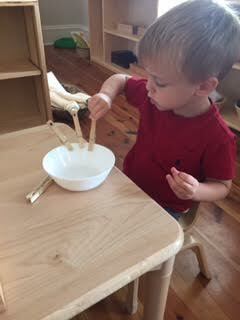 The independence and the pride children feel upon completing tasks, as individuals, will ultimately lead to interdependence in the classroom community and beyond. Practical Life is also where children will learn principles that remain with them throughout their three-year cycle and in all areas of the classroom. They will learn that we always begin with the concrete before the abstract, and they will work from left to right, top to bottom (setting them up for pre-writing and reading). Each of the senses has to be developed before the intellect can develop. Children learn in practical life how to control their physical bodies by first being able to navigate tactilely. When a child is using a dropper, using a button frame or pouring, she is refining her muscular control. The muscles in the hand need to be used and refined in order for a child to later be able to grasp a pencil and put the appropriate pressure on the pencil. Practical Life also lays the foundation for how to go through a process until it is finished and put back on the shelf exactly how the child found it. 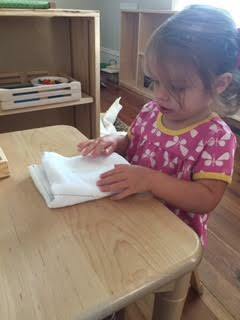 Upon completion of a practical life work, a child learns from the very beginning of her Montessori journey that confidence and self-esteem do not result from someone else proclaiming, “good job!” Children beam with smiles and enthusiasm when they declare, “I can do it myself!” A child may choose the same activity every day for weeks, but she will know when she has achieved mastery and is ready to move on. This self-awareness and knowledge provide a sense of security, but it also becomes a model for future academic and personal achievement. October 28, 2015 1:35 pm | Category: Latest Posts | Comments Off on What is Practical Life and why is my child spooning, pouring and washing windows at school? New life brings us hope and joy. As parents we have so many dreams for the new addition to our family. Dr. Maria Montessori has talked about the newborn child and how a newborn should be treated by the adult to facilitate her psychic and physical development. Following are the suggestions taken from Secret of Childhood by Dr. Montessori. At birth the child enters an alien environment. This period should be carefully studied. She must be handled and taken care of properly. Child initial care should come from the mother. She should not be clothed but put under mother’s warmth for natural source of heat. There should be sufficient awareness of what is required by the newborn child. Newborns should not only be shielded from harm, but measures should also be taken for her psychic adjustments. The child’s room should be calm and quiet, shielded from outside noise. There is no need for any luxury for the child but simple measures should be taken for her psychic growth. Needs of a newborn child are different from the adults, thus special care must be taken for the newborn. The newborn should not be looked as a sick (which we normally feel about an adult), but one who is trying adjust psychologically and physically to the surroundings. The newborn must be handled with care so that she does not feel any anxiety and fear. It should be gentle. The care to the child should be guided by the need of her assistance, not by the fact whether the child is aware about its surroundings and people. For example, the newborn should be handled with care without ever justifying a rough handling by justifying that she doesn’t really feel or is aware about what is happening. “The child is both a hope and promise for mankind.” – Dr. Montessori. Pause, sit down, and think about your childhood. What comes to mind? Do you think about playing with your friends outside? Riding your bike or building forts for hours? Enjoying board games with your family? Now, compare those images to what life is like today. What differences do you see? We spend so much time plugged into computers these days. They’re tiny, hand-held, and convenient little devices. While they have a lot of pros, they also have a lot of cons. The average eight-year-old spends at least two hours each day plugged into some kind of electronic device. That’s fourteen hours a week! So, think about how much time we as adults spend plugged in. It’s kind of scary. The Upper Elementary Class recently had the opportunity to unplug and get out. We took a three day trip to Nature’s Classroom in Mentone, AL, and it was wonderful! Cell phone and internet reception were spotty at best, and there were no televisions. The children truly got back to nature, explored relationships with each other and themselves. They hiked, played games cooperatively, and worked as a team to build a geodome and a rope bridge – just to name a few things. The most technology most of them used were disposable cameras. It was joyful and peaceful! Come to the new Hampton Cove Campus on Friday, October 30th, 5 – 7 p.m. for games, fun, and a chili supper! October 14, 2015 8:44 pm | Category: Elementary | Comments Off on Unplug and Get Out!